In the first section (1) I will outline some shared features of PyCharm and Spyder. I will then continue with describing features that is unique to PyCharm (2) and Spyder (3). 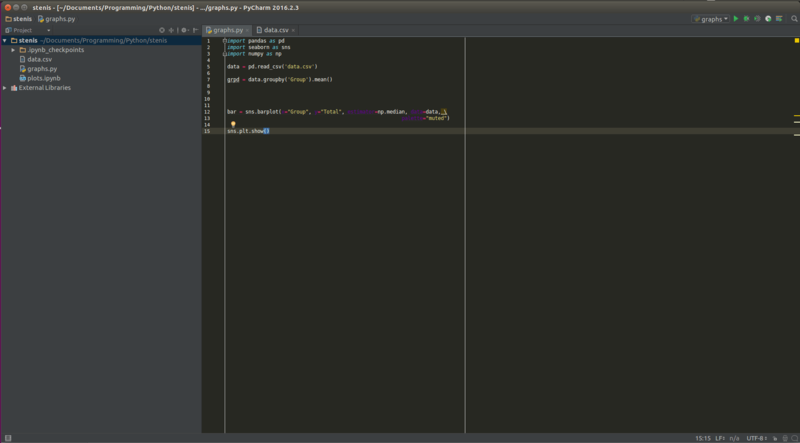 Finally, I will go on and compare the two Python IDEs (4). I will start discussion some of the shared features of PyCharm and Spyder. First, the both IDEs are free (well, Spyder is “more” free compared to PyCharm but if you are a student or a researcher you can get the full version of PyCharm free, also) and cross-platform. This means that you can download and install both Spyder and PyCharm on your Windows, Linux, or OS-X machine. This is of course awesome! PyCharm and Spyder also have the possibility to create projects, an editor with syntax highlighting and introspection for code completion, and have support for plugins. This makes it very easy to search for plugins. For instance, one can install Markdown plugins to also write Markdown files (.md) that can be uploaded to your Github page. That leads me into another GREAT future of PyCharm; support for different types of Version Control Systems (VCS: e.g., GitHub, Subversion, and Mercurial). E.g., uploading your work to GitHub is only a few click aways (if you prefer not to use command line, that is). Another feature of PyCharm is that you can safely rename and delete, extract your methods, among other things. It may be very helpful if you need to rename a variable that is used on various places in your code. First of all, Spyder is made in for and in Python! Of course this is not a feature of the IDE itself but I like that it’s quite pure Python! However, one of the most obvious pros with Spyder is that is much easier to install (e.g., in Ubuntu) compared to PyCharm. Whereas PyCharm must be downloaded and installed, Spyder can be installed using Pip. It is also part of many Linux distributions package manager (e.g., apt in Debian Ubuntu). There is one thing, however, that I really like with the Spyder interface; the variable explorer. In Spyder it is also quite easy to get help. That is, if you are getting stuck, and is not sure how to use a certain function or method. The help function of Spyder IDE lets youtype in the object and get the document string printed out. It can come in very handy, I think. It is easier to install Spyder (at least in Linux) but PyCharm is not that hard to install. In fact, if you are running Ubuntu you can just add a PPA (See here on how to install PyCharm this way) and install PyCharm using your favourite package manager. If you are a Windows user, you just download an installation file (Download PyCharm). Spyder is also part of two great Python distributions, Anaconda and WinPython. Anaconda is cross-platform and WinPython for Windows only. Both distributions comes with most of the Python packages that you may need (and probably more than you need!) Thus, you will get a lot of what you need to write code and Spyder in one installation. 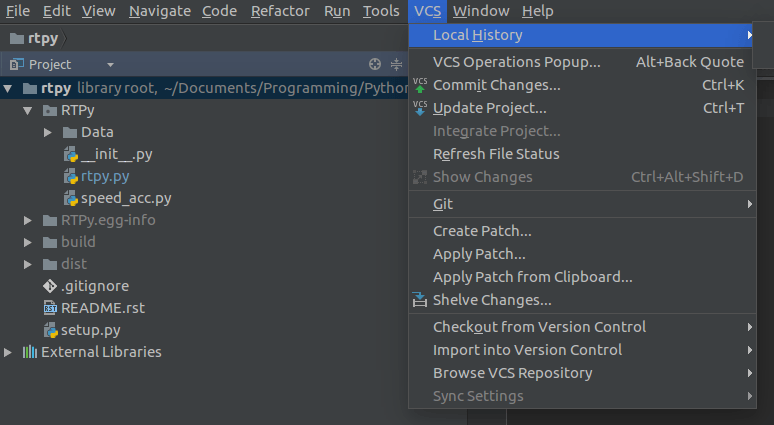 PyCharms have support for VCS systems (e.g., Git and Mercurial) is also a great feature that is in favor for PyCharm. I know that some people find this attractive; they don’t have to use the command line. Okey, which IDE do I think is the best? I think that Spyder, still, is a great IDE. PyCharm do, of course, offer a lot more features. If you are running a relatively new computer and is using Linux (e.g., Ubuntu), PyCharm may be the best (almost) free Python IDE. On the other hand, if you are using Windows and don’t want to install a lot of Python packages by your self, Spyder you can choose to install either Anaconda or WinPython. In fact, in the lab where we run Windows 10 computers, I have installed Anaconda (as can be read in the comments, Python(x, y) is no longer maintained). Here I use Spyder but at home I tend to write in PyCharm. 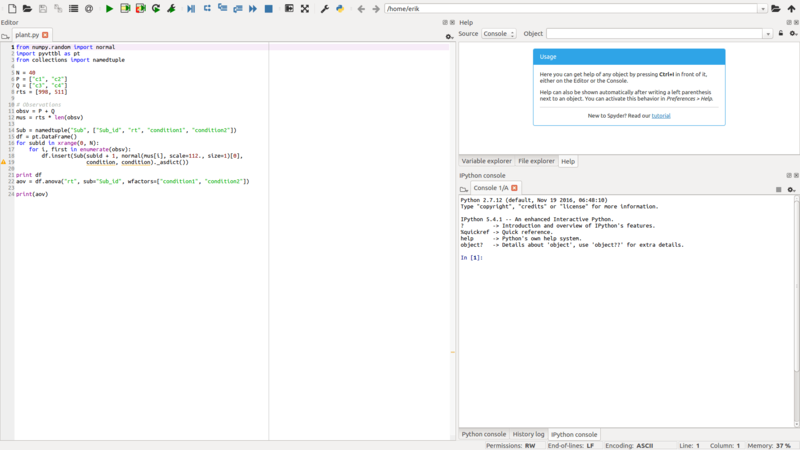 In conclusion, for scientific use maybe Spyder is the best free Python IDE (for Windows, Linux and OS-X). 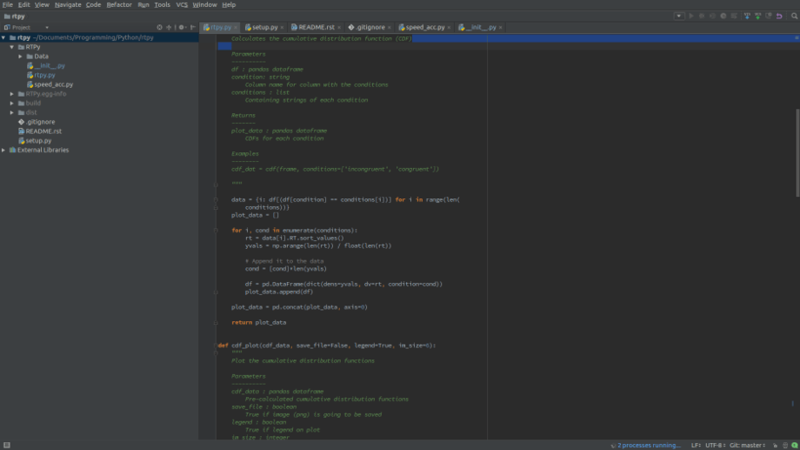 If you are a more general programmer or want to have a lot of features within the user interface, PyCharm may be your choice! Am I missing something or this post contains almost “None” useful information for anybody trying to choose between these two. Pycharm is incredibly difficult to manage venv’s, especially when you are dealing with multiple machines or if your work regularly upgrades your laptop every year or two. Spyder offers the Spyder-Unittest plugin, which adds integrated support for Pytest, Unittest, and Nose tests. With Spyder 3.3+, you can easily open an unlimited number of consoles in multiple Python environments (either venvs, conda envs, different Python installs or even kernels on remote machines) and switch between them on the fly so long as the Spyder-Kernels package is installed in the target environment to enable Spyder’s advanced functionality (Variable Explorer, etc). Spyder 4 will have a number of major improvements in this area with built-in GUI package and environment management and integrating them with an expanded version of the existing Projects system. Python(x, y) is a dead project. The best Python Distributions for Windows (Which are free as well) are Anaconda and WinPython (Which is also almost portable which is great). Thanks for the information. I will have a look at Anaconda and WinPython, and update the post with more correct information. Thanks for your the article. Oh that is cool. Thanks for the information Wasib! Thanks for the comparison, for now I’ll use PyCharm and see how it works out! I love Spyder and I think it’s the best IDE for data science but the fact that it doesn’t have a multi-select feature is a deal-breaker for me. Hence PyCharm ftw. i think spyder is best . Hey, is there a reason is Anaconda crossed out? This would seem to imply that Spyder is no longer included with it, when in fact it is one of its flagship IDEs and installed by default. Also, Spyder 4 is due for final release in the next couple months, with a built-in full-UI dark theme option, GUI package and environment management tools, an improved plugin system, and a brand new, much more powerful debugger and code completion/introspection/analysis architecture, plus hundreds of other improvements. It’d be cool to revist this article once that goes live, as well as developments in PyCharm plugins for scientific computing. Thanks! No, there’s no reason for that and I’ve now removed that. Can’t really remember why it was crossed out. Sounds cool with Spyder 4. Personally, I am mainly using Jupyter Notebooks, right now. But I’ll definitely check Spyder 4 out. 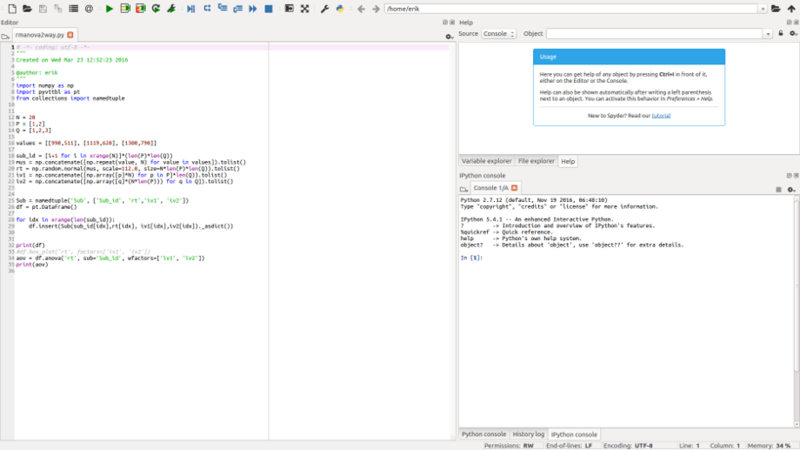 As an Anaconda user (on my Win computers) I still start Spyder 3 from time to time (e.g., for coding app I prefer an editor/IDE). Thanks for the heads up. Jupyter and Spyder are really quite complementary, since they serve distinct niches (although people tend to press the former into roles its not designed or optimal for, whether out of ignorance, convenience, familiarity, or cosmetic appeal). Jupyter notebooks can be a great tool for demonstrating concepts and showcasing short analysis routines, and we actually have a Spyder-Notebook plugin that allows you to work with Jupyter notebooks right inside of Spyder (along with plugins for dynamic report generation, OS terminal support unit tests, vim mode, memory profiling, etc). As you say, for any serious work that needs to be reproducible, modular, scalable or interoperable, Spyder is the choice. Aside from the “whiz-bang” factor of having all code and output inline and producing interactive HTML/CSS/JS visualization and output (which the Spyder-Notebook plugin enables), Spyder gives the researcher essentially the same core tools—line by line, cell-based or full-file execution, a log of all input and output, inline plots, the power of the IPython interpreter and Jupyter kernel infrastructure including the same magics and starting/connecting to any local or remote kernel, on-demand help, etc.—along with numerous others, all in a real native application rather than a web app and producing standard Python scripts, modules and packages that can be much more easily shared and re-used by anyone as opposed to operating within the limited confines of the Jupyter “bubble”. Spyder has been my favorite IDE too – but this might be why Anaconda was crossed out. I would have removed that one to avoid confusion as I wrote the updated one a good long while ago, but I still need to update some of the readmes for the many packages in our organization to point to the new link. Btw, I love Spyder. Best of luck to you and your team. No need to apologize! Actually Carlos Córdoba, Spyder’s lead maintainer, originally wrote that document you linked to; I only added some minor updates and fixes on that one. I should add a link to the updated version from that one, to make the current status clear. And thanks for your kind words! The one thing I like most about RStudio is that you can see the variable contents without putting print statements all over the place unlike the Python IDE where it is more cumbersome or one must put print statements. That’s one of my favorite RStudio features as well. However, not sure which “Python IDE” you’re referring to, but as the author discusses and showcases a simple example of, Spyder actually has a full-featured Variable Explorer panel that can not only display dataframes like Rstudio in a custom viewer, but also Numpy arrays, Pillow images, Python lists, sets, dictionaries, and tuples, and even functions, classes, modules and arbitrary Python objects alongside all the basic scalar types, datatimes/timestamps/timedeltas and the like; on top of that, it actually actually lets you interactively edit any of these that are mutable, as well as perform a number of other operations. In most respects, I’ve actually found it *more* powerful than Rstudio. It does not seem that Pycharm Spyder update the Variable Explorer as values are changed. I don’t know about Pycharm (and I don’t think it *has* a Variable Explorer, so not sure what you’re talking about? ), but Spyder’s Variable Explorer (as shown in the main window) does update dynamically. Opened sub-viewers (e.g. for dataframes, arrays, collections, etc) don’t update automatically with external changes (as opposed to ones you make directly there) by design (you can always open a fresh one), but we’re currently discussing adding a refresh button to existing Variable Explorer sub-windows.